We have chosen a new location for our annual TASC Dinner & Dance in 2016. It will be held at the Rose-in-Vale, Mithian, Near St. Agnes, Truro, TR5 0QD. Further details will be put on here in good time. A well attended A.G.M. was once again held at the St. Austell Brewery Visitor Centre. Special thanks must go to our President John Treglown in organising the evening. We were delighted to have several members of the C.R.F.U. with us including Chairman Denis Preece. In his address, Chairman Phil Trevarton welcomed everyone and expressed on behalf of “the Army” the immense pride of the club in Cornwall winning the Bill Beaumont Cup at Twickenham last May. Also the Cornwall Under 20s in reaching the national semi-finals. Hon. Sec. Ian Gordon, in his report, outlined the club’s sponsorship plans for 2015-15. The Trelawny’s Army Cornwall Colts League is already up and running and we have the option for a further year in 2016-17. The clubs that achieved promotion last will again receive balls from the Army, and we will in addition again sponsor the county under 7s and under 8s festival at Penryn, and also the under 9s at St. Austell. Reports were then submitted by the various officers; these are on file should any member wish to look at them further. The Bowling will take place on Sunday November 8. Contact Jenny for further details. In the player’s absence, the “Bill Osborne Memorial Shield” for the Cornwall Player of the Year was received on Matt Shepherd’s behalf by Colin Hatch Cornwall Team Secretary. Colin read out a message from Matt, who was sorry he could not be with us and expressed his pride at being chosen and thanked the Army for their wonderful support. The “Tony Mead Memorial Shield” for the Cornwall Under 20 player of the year was accepted on Tommy Phillips’ behalf by Bill Hooper. Both players will receive their shields at their clubs’ next home game on Saturday 10 October. Life membership of the club was bestowed on Thelma Sweet in recognition of her sterling work and support over the years. 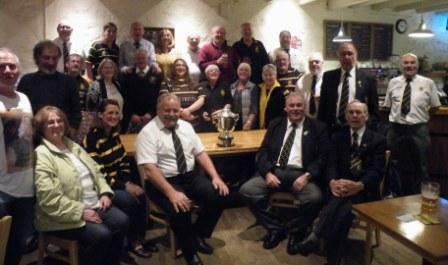 There was a toast to celebrate Cornwall’s win in May before the meeting concluded with a rousing rendition of Trelawny! Cornwall’s triumph at Twickenham in winning the Bill Beaumont Cup ensured huge interest from the membership in choosing this season’s Player of the Year. There were no shortage of candidates in the running for the Cornwall Senior Player of the Year award, but in the end voting was pretty well unanimous for our winner, former Cornish All Black scrum-half Matt Shepherd, now with Graham Dawe’s Plymouth Albion. Shepherd, a product of the St. Austell club, previously had a spell with Redruth at National League level before re-joining St. Austell, guiding them to promotion to South West 1 West, plus a second Cornwall Knock Out Cup final in 2014, where they lost to Camborne. He joined Launceston last season to improve his game and that led to his having a campaign to remember. He picked up the Paul Bawden trophy as man-of-the-match in Cornwall’s Tamar Cup win against Devon, the first player to win that particular accolade twice. He then help mastermind Cornwall’s assault on Twickenham, scoring four tries during the Championship, including two in the final and kicked a total of forty-two points. Shepherd’s exploits last May saw him fully deserve his selection by England Counties for the tour to Romania. The Tony Mead Memorial Shield for Cornwall U20 Player goes to loose-head prop forward Tommy Phillips, who spent last season at Redruth having joined the club from Truro College. Tommy is product of Helston RFC mini and juniors, and has previously been awarded the Mischler Cup as Cornwall U18 group player of the year. Tommy’s progress with the Reds was truly outstanding last season and he was called up to the full county squad making his debut in the Tamar Cup and going on to be part of the County Championship squad. One of the stars of the Cornwall Under 20 side that reached the National semi-final, that lost to eventual champions Yorkshire at Camborne, Tommy attended the Welbeck festival were he won selection for the England Counties Under 20 tour to Hungary last June. The young prospect’s performances have seen him earn a Player Development Fund contract with the Cornish Pirates this season. He made his debut for the Pirates in the pre-season game against Camborne and also featured in the big win against Bath University at Torquay. He has been sent back on loan to Redruth to further his development. Sadly, due to prior commitments, neither player will be available to receive their awards on the night. Matt Shepherd’s father, Bernie, will receive the award on Matt’s behalf on Wednesday evening 30 September, at the St. Austell Brewery Visitor Centre, at the conclusion of the TASC A.G.M. It is hoped to re-present the award to Matt at Plymouth Albion’s next home match, against Esher on Saturday 10 October. Similarly, Tommy Phillips will be presented with his award following Redruth’s home game against Chinnor on the same Saturday. 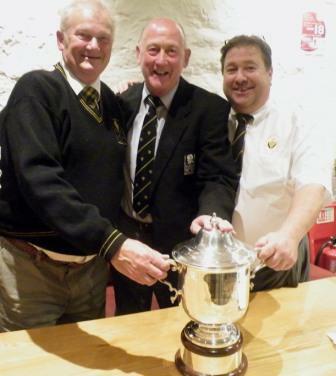 Trelawny’s Army was saddened to learn of the passing yesterday, of Cornwall RFU’s President John Grindle. TASC wishes to express it’s condolences to all John’s family and close friends. Tuesday 8 September 2015, St Columb Major Church, at 12 noon. Joyce and the family would be please see all attending the funeral at Bristol Hotel Newquay after the internment. The club’s Annual General Meeting (A.G.M.) will be held on Wednesday 30th September 2015 at the St. Austell Brewery Visitor Centre, 7:30 pm. All paid up members and life members are cordially invited. Members should have received their voting slips for the Cornwall Senior & Cornwall Under 20 players of the year. Please return your nominations to Hon. Sec. Ian Gordon by Monday 7th September. No votes received after this cut off will be included! It is hoped to have members of the CRFU present as well as the players who have won the awards. Rugby’s most prestigious prize, the Webb Ellis Cup, has arrived in England (Cornwall) with the Rugby World Cup Trophy Tour, counting down 75 days until the start of the Tournament. This morning, RFU President and Rugby World Cup 2003 winner Jason Leonard OBE will take the Trophy to Five Islands School on the Isles of Scilly where he will join the Cornish Pirates for a Rugby training session. He will then take the Trophy on a short helicopter ride to the Eden Project, near St. Austell, where local school children will have the opportunity to have their photos taken with it inside one of the Biomes. This afternoon, continuing the summer holiday theme, Jason Leonard will take the Webb Ellis Cup to a school’s beach Rugby event at Perranporth Beach. Jason Leonard OBE, RFU President, said: “This year will be the most significant in the history of the game in England and it’s an exciting opportunity for us to raise the profile of Rugby through the Trophy Tour, in particular amongst grass roots clubs, across the country. Rugby really is a sport for everyone, for all shapes, sizes, abilities and backgrounds – men, women, boys and girls – and it’s great to see so many people already feeling the excitement of Rugby World Cup 2015. Contact Marina if you are interested. Contact details via the link here. If you want to catch up with TASC this summer you will find us at four summer agricultural shows. All are great shows and the trade stand will be there for you to see our stock. Paid up members will shortly be receiving their voting slips for the Player of the Year, awards to be made at our A.G.M. in October. The Cornwall Under 20 player of the year who will receive the Tony Mead Memorial Shield. New members will eligible to vote, so sign up now! Click here or see membership secretary contact details under ABOUT on the menu bar and JOIN US. CORNWALL’S Bill Beaumont Cup final against Lancashire will kick-off at 12:00 noon Sunday 31st May. The game is the second of four on the day which includes England vs. Barbarians, kick-off 3 pm. Trelawny’s Army Supporters Club is running three coaches to the final. Two of these will leave on Saturday morning with an overnight stay at the IBIS Hotel Reading. The third coach is an up and back on the Sunday departing Penzance at 03:00 hours. Please contact TASC Transport Officer Bryan Llewellyn on 07895 089890 for further information.